Last month, I was treated to a Hipcooks cooking class in Seattle by my dear friend, Lynn. The theme was Dim Sum and then Some. The class was fun and though the dim sum was very untraditional and not what you’d actually eat in a dim sum restaurant, it was very tasty. My favorite recipe was for scallion pancakes stuffed with shitake mushrooms. I recreated the recipe at home using a more traditional Chinese scallion pancake recipe. The hipcooks scallion pancake version is essentially a crepe, so it is very thin and pliable – pliable enough to stuff the shitake mushrooms in it like a burrito. 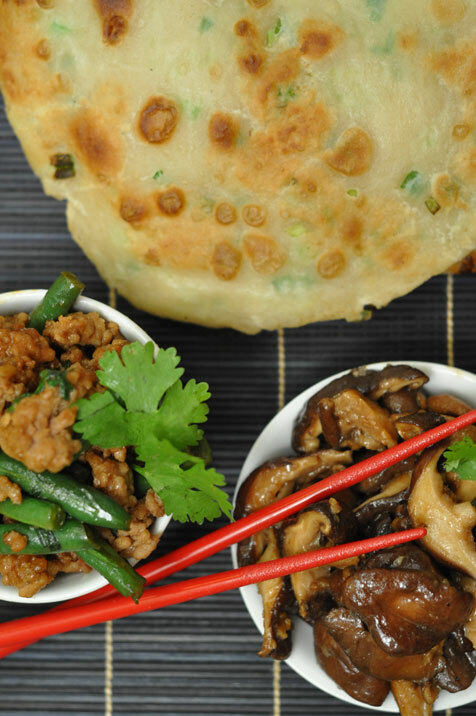 The traditional dimsum scallion pancake is thicker and heartier; crisp on the outside and soft on the inside. I , of course, liked both versions…. Saute the mushrooms in the sesame oil until the pan looks dry. Add the soy sauce, balsamic and hoisin sauce. The original recipe calls for just drizzling the hoisin sauce over the mushroom stuffed crepes (scallion pancakes), but I like it in with the mushrooms. Adjust seasonings per your personal preference. If making the hipcooks scallion pancakes place some mushrooms in the scallion pancake and roll up like a burrito and drizzle with the hoisin sauce. Add 1/3 cup shortening/ lard to flour. Cut together with a pastry blender or chopsticks. Add enough hot water to flour mixture to make dough consistency of biscuit dough. Blend with chopsticks. Knead for about 5 minutes. Cover with wet cloth for about 30 minutes. Divide dough into 6 pieces. Roll each piece out until 1/8 inch thick and brush lard over it. Sprinkle chopped scallions and some salt on top. Roll it up, pinch the ends closed and squeeze it into a ball. Now roll out again about 1/4 inch thick. Fry in a little hot peanut oil until both sides are brown. Cut each pancake into four wedges and serve as an accompaniment to the shitake mushrooms or any other stir fried dish. Blend all of the ingredients except scallions and allow to rest for a few minutes. Add the scallions and mix together. Make crepes in a well buttered pan.